The Mosfell Archaeological Project is an international research project employing the tools of history, archaeology, anthropology, genetics, saga studies and environmental sciences to construct a comprehensive picture of human adaptation and environmental change in the Mosfell region of southwestern Iceland beginning in the Viking Age. See the recent article in Backdirt. The summary below explains details of the overall project. Explore the excavations and surveys year-by-year in the Archaeological Field Work section here. The Mosfell Archaeological Project has implications for the larger study of Viking Age and later medieval Iceland, as well as perhaps for the north Atlantic world. Mosfellssveit encapsulates the major ecologies of Iceland: coastal, riverine, and highland. Culturally, the region is equally representative. In some ways it was a self-contained social and economic unit. In other ways, it was connected to the rest of Iceland, not least, through a network of roads, including an east-west route to the nearby meeting of the yearly Althing. With its coastal port at Leiruvogur, the region was in commercial and cultural contact with the larger Scandinavian and European worlds, possibly as far east as Constantinople. The research, in reconstructing the early social history of the Mosfell Valley region, will integrate information on the changing periods of occupation. We will excavate individual sites, both secular and religious, and consider their placement in relationship to one another. We will examine the apportionment of open spaces and the utilization of common lands in the highlands and on the coast. Written, archaeological, and other scientific information will be integrated into this study as we construct a picture of early life. The different specialists on our team will explore among other subjects the development of roads and paths, the importance of the ships landings at Leiruvogur, the changes over time in subsistence strategies, the state of health and disease in the Viking Age and later population, developments in building technics, and the usage of smaller activity areas, such as the sel, or summer dairy stations. Crucial tasks are finding the locations of early farm sites, the remains of turf buildings, roads, burials, agricultural enclosures, and port facilities before they are destroyed by modern construction or lost to human memory. 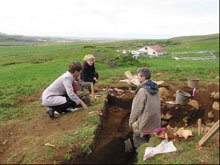 Ragnheiður Ríkharðsdóttir, the Bæjarstjóri (Mayor) of Mosfellsbær discussing the excavation with Patricia Lambert and Jesse Byock. The Mosfell Archaeological Project is generously sponsored by Arcadia and administered by the UCLA Center for Medieval & Renaissance Studies and Vikingaminjar.